Problems caused by climate change and rising energy prices have meant that households and communities are seeking new ways in which to tackle their increasing energy consumption and related costs. By working together, communities have the power to mobilise their members and develop sustainable energy projects such as renewable energy generation or energy efficiency measures. Two communities in Finland, Ylä-Kivelä and Kaakonoja, involve two completely different types of community energy activities, but they have shared motives, experiences and learning about developing a local sustainable energy project. In 2009 Ylä-Kivelä, an apartment block in central Finland, became one of the first private apartment blocks in the country to replace a 30-year old oil heating system with a renewable energy system. The red-brick building was built in the 1980s and is located in a leafy part of Keuruu. Its 40 apartments have around 50-60, mostly owner-occupier residents. The block’s caretaker and past resident, Lauri Lahtinen, had been considering alternatives to oil for some time, largely affected by the block’s increasing heating costs. Rises in global oil prices had been heavily reflected also on the price of oil-based residential heating. One of the options was to join the local district heating network, but this too had its drawbacks as Keuruu has one of the most expensive district heating in Finland. Hence Lahtinen, together with the block’s management board, started to consider alternative options. They were aware that another apartment block in Keuruu had replaced its oil-based heating system with a biomass system in 2007 and had had positive user experiences. Based on positive feedback and installer recommendations, Ylä-Kivelä opted for a heating system which included a pellet boiler and solar thermal heating collectors. Affordability and locality were key in Ylä-Kivelä’s decision-making. The pellets, for instance, come from a nearby town, and Ylä-Kivelä initially signed a 2-year contract with the supplier. The project was jointly funded by the residents (85%) and the Finnish Government’s Energy Fund (15%), which allocates capital grants to energy projects. Residents were given the opportunity to pay their share of the new heating system either by a one-off payment or pay it as a loan over five years. Effectively the apartment block took a loan for the five-year payments and these were added to each apartment’s monthly service maintenance charge (which worked out around EUR 0.70 / square meter). Around 1/3 of the residents paid their share by the one-off payment and the rest took out the loan option. Funding for the project was relatively easy and low risk, as the loan was guaranteed by the apartment block. The residents at Ylä-Kivelä have been happy with the project, especially the solar thermal collectors, and feel that they have installed something truly new and rather innovative. Several of the residents had little previous knowledge about renewable energy, relying mainly on the information they were given by various suppliers and caretaker Lahtinen. After initial technical adjustments to the pellet system, the heating system has been working well and the block has made considerable savings. 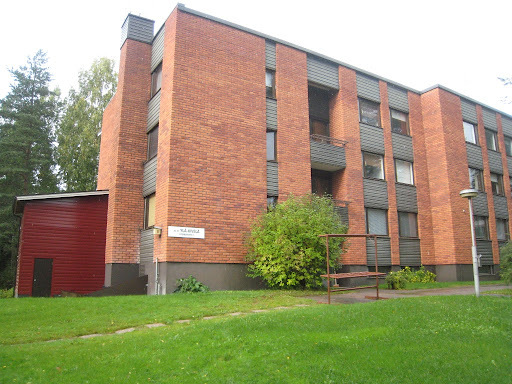 Compared to a same size apartment block which is connected to the local district heating network in the same neighbourhood, the Ylä-Kivelä block has witnessed savings of around EUR 8,500 per year in the first two years of the pellet-solar system’s operation. Furthermore, the Ylä-Kivelä block was chosen as the Housing Company of the Year in 2009 by the Finnish Housing Company Association, receiving a EUR 1,000 reward. Kaakonoja Area Residents’ Association is a residential community association based in Valkeakoski, central Finland. It was formed as a not-for-profit organisation in 1983 and has approximately 250 members consisting of detached housed built in the 1950s and 1960s. The association has been active in organising events for its members, including spring garden clearing, theatre visits and trips abroad. In 2008, two of the association’s members initiated a project identifying air and ground source heat pumps suitable for their area. 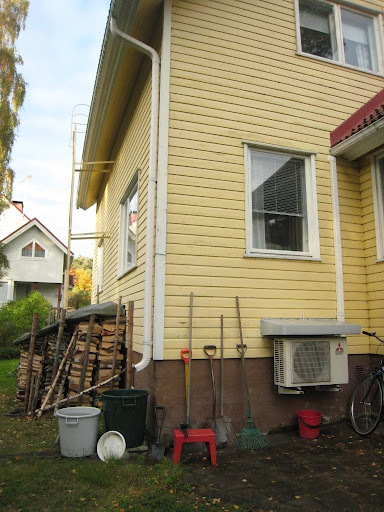 At the time several heat pump models were entering the Finnish market, but the residents in Kaakonoja found it difficult to identify reliable sources regarding information on various heat pump models. Hannu Mäkelä, a retired journalist, and his neighbour of 30-years and a retired electrical engineer Tuomo Knuuttila, had seen their heating bills soar year-by-year and they wanted to explore ways in which to save energy. In order to fill this gap, the Kaakonoja heat pump project was set up to rank available heat pump models according to certain variables (such as maximum heating output, outside temperature range within which the models operate, cooling power, energy efficiency, noise, guarantee etc.). A total of 82 heat pump models were selected for the project, of which 46 were rated. This eventually led to three air source heat pump models being chosen as the most suitable for the Kaakonoja area houses. To set the project up, the residents’ association sought external funding and expert knowledge in heat pump technology. Most of the funding was awarded by the EU Leader funding programme (90%), while the residents’ association covered some of the costs (10%). The local Valkeakoski Vocational College and Tampere University of Technology provided specialist technical advisors for the project. Through the creation of the heat pump project, the Kaakonoja residents’ association effectively built their own network and knowledge base of energy technology. They also readily spread their findings and organised a “heat pump day” with presentations from installers and which was open to the general public. They expected around 100 visitors but were taken by surprise as almost 700 attended. The Kaakonoja residents had high expectations for their project. Their main motive was to find independent and reliable information on heat pumps and they feel that this has been achieved. During the project, around 120 households were considering installing a heat pump and at the end of 2011, 90 houses had done so. Furthermore, those who have installed a heat pump have had good user experiences with them, which were no doubt aided by the fact that the installers were given the requirement to also include user guidance in any installation undertaken at Kaakonoja. Mäkelä’s own data collection for instance has shown more savings on heating bills than he had initially anticipated and his living comfort has increased. His house tends to be more evenly heated in winter and he has also been able to utilise the cooling option in the recent hot summers. Both cases, Ylä-Kivelä and Kaakonoja, are community energy pioneers in their own right. They involved technologies that were new to the communities and of which the residents had little previous knowledge. Both cases also had so called ‘community leaders’ initiating the projects. In Ylä-Kivelä, Lahtinen was a trusted figure in the apartment block through his somewhat nostalgic caretaker role – most of these jobs have been outsourced to external management companies – and the residents were willing to listen to him. In Kaakonoja, Mäkelä was a leading figure in the local community. He had for instance a reputation as being the association’s travel agent and had successfully organised several trips for them. However, these men were not purely dictating what others were to do. In both cases, there was existing community cohesion and several activities that the residents had arranged together and which had benefitted their neighbourhood. Neither of the projects would have come alive without some type of external funding, either in the form of loans or grants. This is often the reason why community energy projects struggle. They have the will and some skills to get started, but without external sources of funding projects have difficulty coming off the ground. In the UK for instance, around 200 communities are benefiting this year from the Department of Energy and Climate Change’s Local Energy Assessment Fund, but not all countries have the same policy support. Residents in the two Finnish communities felt that there was a need for more open political discussion about the potential of local sustainable energy projects and actors like households or communities becoming active participants in the energy system. The residents felt that the potential for community energy and projects such as theirs is large but there are still barriers to development. In addition to political support and funding, projects also need creation of knowledge. Not only within communities but also at the level of decision makers who may not know how sustainable energy projects can be delivered at the local level. There is a clear need for more demonstration projects, in order to show political leaders what works in real life. Projects need external support, but also an open mind from everyone involved. As one resident in Ylä-Kivelä described it, their project required courage from the residents, given that no one else had installed exactly the same kind of a pellet-solar system at the same scale before. Any successful community energy project is down to the hard work and persistence of the communities themselves, also involving the willingness to try something new and perhaps out of the ordinary.